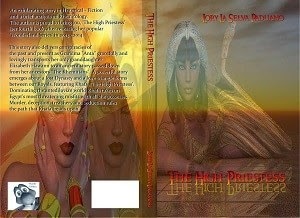 Lory La Selva Paduano is the author of the historical-fiction novel The High Priestess. ln a narrative setting, 'The High Priestess' is a story retold time after time to all those of 'Khemithian' backgrounds. Khemit is a mystacism about ancient Egypt that many have yet to discover. From a lost Dynasty, to the conspiracies brought forth by the present, it envelopes your heart and ships it right back to the fascinating era. Khafa our High priestess, is sure not to disappoint our readers, as she takes on Egypts most dangerous misfits in our Fictional aspect of the story, and Elizabeth Hawann our second main character follows a life long path of discoveries that lead her to the full story, and closer than ever to her destiny and 'The High Priestess' . Describe the plot of your new book. The plot of this book was really to emphasize on two things, to bring forth the mysticism of Khemit and to implement it's teachings in an adventurous way! Educating many was the goal, but keeping it fun was essential to my creative side. Mostly people who love, "the truth in the lie." Yeah, it's that kind of Fiction! (as Stephen King once said) and of course all those who love History and conspiracies, some good ol' romance, twists and turns also. What can you tell us about The Khemitians? They were the people who we now call Hebrews, Tibetans, Russians, European and many of today's black African Tribes. Highly lntelligent people, who used all their senses, to be exact all three hundred and sixty natural human senses, capable of so much more than our civilization today. They were the people who built such fabulous and monsterous structures of our ancient times. What inspired you to write a historical fiction set in Egypt? I've always loved Egypt! From when I can remember that is. I love the mystery and intrigue it ignites in all of us, yet in so many ways she's so open to its past, but no one's listening or looking in the right direction, so I felt a need to expose that. Khafa by far! The actual High Priestess herself,, and that's because she's everything I'm not! How do you hope reading your book will impact readers? I'd love for them to connect with the Historical parts and the Khemitology aspect, just because it's so cool and unexpected, it's a little different and unusual, it's educational but fun and entertaining. Can you tell us a bit about the creative process of this book, from initial idea to finished book? I was sitting in my living room one Sunday afternoon last summer, as I was flipping channels, I came across a documentary of Egypt, as I so often watch. The whole family was here, and as I soaked up it's story line, I began looking at it's purpose. I saw something that needed to be written! lt was an instant marriage between me and the pages not long after, and I remember everyone staring at me that day and shouting "Write about this, now!" lt was hilarious, as if we were all thinking the same thing. My next project is for my readers, they've asked me to write about Ancient Rome, and it'll be a wonderful story in Historical - Fiction no less. I want to write about my ancestral roots, and implementing Historical facts, with an epic Fictional side with twists and turns like never before will have everyone with their mouths open ! Book 5 is Entitled 'The Legacy of a Legend' and part of the proceeds will go to the charity of my choice.